In Course 101, we examined the work of some thorough and reliable researchers, giving us a basic picture of who is guiding world events, how they exercise their power, and what their basic agenda is. In 201, we will be looking at how to make use of this basic information, and we’ll look at some examples, re/ interpreting ongoing events. But first, let’s summarize a few key points about the bankster elite, using a few quotations from our sources. …the powers of financial capitalism had another far-reaching aim, nothing less than to create a world system of financial control in private hands able to dominate the political system of each country and the economy of the world as a whole. This system was to be controlled in a feudalist fashion by the central banks of the world acting in concert, by secret agreements arrive at infrequent private meetings and conferences. The apex of the system was to be the Bank for International Settlements [BIS] in Basle, Switzerland, a private bank owned and controlled by the world’s central banks which were themselves private corporations. They controlled the press, the politicians and more importantly perhaps, they controlled the Federal Reserve System and the Bank of England. Professor Quigley clearly explains and details their ‘triple front penetration’ of politics, the press and education. Virtually every major geopolitical event over the last century stems from this tiny, all-powerful clique. By acting in concert and in secret, in alliance with associated financial institutions, the central banksters orchestrated the banking system collapse of 2008. By their control of politicians, they then achieved a transfer of insolvency from banks to national treasuries (the bailouts), creating an economic regime of unrepayable sovereign debt, a trap that will soon also ensnare the USA, Germany, and the rest. The banksters are then using this debt-enslavement to impose an austerity regime that is reducing Western populations to the level of feudal serfs, disempowered both economically and politically. The feudal model applies quite closely to what is happening. As nations are forced to sell off all their assets (universal privatization), in a hopeless attempt to escape from insolvency, a situation is created where all land and resources will be owned by corporations, and ultimately controlled by the banksters, just as in feudal days all was owned by the lords of manors, and ultimately controlled by the crown. The main difference seems to be that the bankster regime will be more centralized than the feudal system was. With modern communications and technology, there is no need for subsidiary lords and nobles, with their own semi-automous realms, to provide a stable political platform for the royal realm. In the bankster regime, it is more like all estates will be owned directly by the crown, with centrally-appointed estate-manager technocrats enforcing central directives locally. Exactly as we see unfolding now, most clearly in Greece, Italy, Spain, and Ireland, where Goldman Sachs, co-orchestrator of the collapse, is providing some of the estate-manager staff. It seems that we have a very good fit, between design and outcomes – the bankster clique is evidently still very much in charge, on course, and in the endgame of installing their long-sought neo-feudal world order. I emphasized that paragraph, because it is the central thing to keep always in mind when seeking to interpret the meaning of unfolding events. In particular, it is important to contemplate on what it means to be in an endgame scenario. When you begin making your bold endgame moves, pushing toward a forced checkmate, you must have a combination worked out, so that you prevail against all available lines of defense. Otherwise your bold moves may open you up to a decisive counter-attack and rout. And quite clearly, the bankster clique has demonstrated over the years its proficiency, and thoroughness, as regards chess-like great games. If we are in the endgame, then we can be sure they have preparations in place to deal with all aspects of the transition to the new regime, taking into account alternatives available to other players in the game. One of those players is us 99%, who might be expected to rebel, in one way or another, as we see our society being destroyed, and as the perpetrators become more and more visible, as they reveal their endgame moves. Their preparations to deal with us are very clear: the ‘anti-terrorist’ no-civil-rights legal regime, militarized and federalized police forces, and crowd-control protocols based on suppression by any means necessary. All of this facilitated by false-flag events that created the excuse. Ducks carefully arranged in a row, prior to endgame moves. Russia and China are the players, at the geopolitical level, who have alternatives available that can effect the nature of the endgame. They are also players with an impressive centuries-long track record with chess-like engagements. They know very well the nature of the endgame they find themselves in, and they want desperately to force a multi-polar draw, and prevent a unipolar checkmate. The bankster elite, however, have demonstrated over the years singleness of purpose, and a total unwillingness to accept anything as an outcome other than complete, unchallenged, unshared power. A multi-polar outcome is not on the table for consideration, in their endgame plans. If Russia and China will not capitulate, the regime will be forced upon their territory by whatever means necessary, based on the preparations that have been made. Among those preparations is a first-strike nuclear capability, with US bases and missle-defense systems surrounding Russia and China, with tactical nuclear weapons widely deployed, under the control of local commanders, and with electronic satellite-based systems that can critically disable the communication and defense systems of adversaries. In order to interpret unfolding events, one needs to be aware, at a visceral level, that we are in the midst of a dynamic transition process, involving the rapid demolition of an old order, and the rapid creation of a new order, all being carried out according to a carefully designed game plan. With this awareness, the mainstream media can be very helpful in tracking the ongoing moves of the endgame. For the mainstream media has a very predictable way of covering key moves in the game, key shifts in the board positions. For a start, such moves are always given front page attention, as leading news items. Always with these moves some old-system taboo is being violated, and some new-system principle is being put in place as a justification. The function of the media is to dismiss the taboo as out-of-date thinking, and embrace the necessity and wisdom of the new principle, despite unfortunate side-effects that cannot, unfortunately be avoided. Thus torture becomes acceptable, along with unprovoked invasions, drone strikes on the civilians of allies, targeted killings of your own citizens, supplying arms to active Al Qaeda terrorists, and the list goes on. By following the headlines associated with dramatic incidents, and reading the propaganda copy, you can track the step-by-step demolition of the old order, and the systematic construction of the new system architecture. This applies to all aspects of society, not just to geopolitical events. Wherever you see dramatic precedents being set, in leading news stories, you are probably seeing signs of what is being abandoned, and what is being planned for the future. The example that comes most quickly to mind is the celebrated swine flu ‘pandemic’, which was carried on mainstream media for many months, and which led to the setting of several important precedents. Not only was the definition of pandemic given a nonsense redefinition, but a regime was set up where the bankster-controlled WHO can decree a pandemic on the flimsiest of excuses, and can designate which vaccines must be used in treating it, with no accountability as regards testing, and with no liability being assumed for any ‘side effects’. In addition there was an intense and ongoing worldwide propaganda campaign about the value and necessity of getting vaccinated. And there were clearly steps being taken toward creating a forced-vaccination regime, beginning with health workers all over the world as a test population. If total control over the global population is the goal, then the ability to inject arbitrary substances at any time into the bodies of any segment of the population is certainly a very powerful tool to have in your toolkit, whether it be to narcotize, hype-up, temporarily disable, or eliminate altogether. And this ends Course 201, of the Realpolitik series. If some of you want to try your hand at interpretation, by delving into some dramatic media story line, we can perhaps continue with a seminar series. Your analysis is just as important as your conclusions, as regards any seminar contribution. What we’re after is an understanding of why a given precedent is relevant to the new regime, and what that indicates about the nature of the new regime. In a previous post (Who Will occupy Whom? A Warning for OWS) I warned about threats to the occupy movement and suggested a general strategy for achieving popular empowerment, peace, justice, and personal freedom. That post was prompted by, and included, an insightful article by Richard K. Moore. This one is stimulated by an article by Chris Hedges that highlights a more immediate threat that has recently developed in Oakland and elsewhere. That threat appears in the form of violent mob action that goes under the rubric of The Black Bloc. According to Wikipedia, “The Black Bloc is sometimes incorrectly reported as being the name of a specific anarchist group. It is, rather, a tactic that may be adopted by groups of various motivations and methods.” Those methods include violent confrontation with authority and destruction of property, tactics that play right into the hands of domineering oligarchs intent of preserving their privilege and hold on power. No doubt, the actions of many Black Bloc protesters are motivated by their ardently held, though misguided, ideology, but it seems likely that there are among their leadership agents provocateur who are intent on helping to maintain the present power structure by discrediting any opposition to it. The media have generally characterized these anarchist actions as being part of the Occupy movement, but as Chris Hedges points out in his article, The Cancer in Occupy, The Black Bloc is no friend to the Occupy movement which began as peaceful expressions of discontent with the status quo, and is hopefully maturing into a progressive movement toward popular empowerment. Hedges calls the Black Bloc anarchists “the cancer of the Occupy movement,” and I’m inclined to agree. One feature of the Black Bloc protesters, and the basis for the name, is that they dress in black clothing and use ski masks, scarves, sun glasses, and other means to obscure their faces. But anonymity and concealment are antithetical to civil society and are more likely to enable criminal and anti-social activity rather than protection for the legitimate assertion of people’s rights. Any movement will eventually develop factions that diverge on the basis of philosophy, goals, strategies and tactics. The mainstream of the Occupy movement must find ways to distance itself from such groups and tactics because, as Hedges points out, “Once the Occupy movement is painted as a flag-burning, rock-throwing, angry mob we are finished. If we become isolated we can be crushed.” One way to preserve the legitimacy of the movement is to insist on openness and transparency. If that can be expressed strongly enough, it might preserve in the public mind the identity of Occupy as a benign and creative force. I believe that the ends are inherent in the means and that, “we wrestle not against flesh and blood, but against principalities, against powers, against the rulers of the darkness of this world, against spiritual wickedness in high places.” (Ephesians 6:12, KJV). The Occupy movement must move toward disciplined organization and employ tactics that are at once compassionate and effective, tactics that even progressives who work within the establishment can embrace. It must be a form of organization that relies not on power hierarchies, but on solidarity and consensus within small communities of peers organized into large networks than can enable concerted action. The real threat to the powers that be, (and the most promising path toward our goals) is intelligent, non-violent, empowering actions that make them and their systems irrelevant. The way forward, as I see it, is to assert our fundamental rights and to organize better ways of providing for our basic needs. Yes, there will be adverse consequences, but ultimately right will prevail. I am reminded of a scene from the film Gandhi, in which the mahatma leads a large number of people on a march to the sea—to make salt. Why was that a revolutionary act? Because the British government had a “legal” monopoly that forced people in India to buy their salt from that single source. What a patent absurdity, to tell people that they are prohibited from making their own salt. What a gross infringement of basic human rights! But people everywhere today suffer under equally absurd “laws” that force people to rely upon banking cartels to provide government-approved forms of money to enable the exchange of the goods and services we all need. In some places, competing forms of currency and financing alternatives are prohibited outright, in others they are impeded by onerous taxation and reporting requirements. But ultimately, the people will reclaim the credit commons and free themselves from oppressive systems of money and finance. 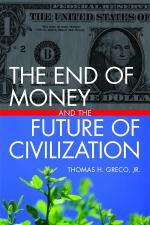 I urge you again to heed the prescriptions outlined in my book, The End of Money and the Future of Civilization.